Educators in the United States and South Africa are continually faced with the challenge of how to better incorporate diverse groups of students, improving the education experience for all. Stubborn Roots argues that schools in these two regions – weakened historically by racial and ethnic discrimination – will greatly miss the benefits of a critical social policy for reducing inequality via education if they do not pay sufficient attention to the socio-cultural context within schools . Jo Taylor believes this book should encourage more educational specialists to make their findings accessible to teaching professionals. 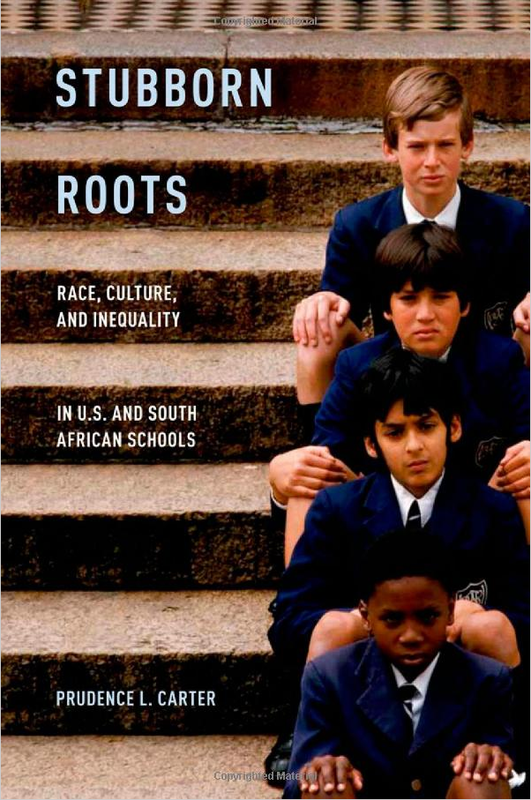 Stubborn Roots: Race, Culture and Inequality in US and South African Schools. Prudence Carter. Oxford University Press. May 2012. Stubborn Roots analyses and contrasts the education systems in South Africa and the United States, focusing on racial and social inequality that exists within them. Prudence Carter, Professor of Sociology at Stanford, provides a winding journey through her important research and finishes the book with helpful suggestions on how to increase access to education for groups who need it most. The book is well-written – as one would expect from an author so well-published on the topic – and both direct and challenging. Not challenging in its prose, but challenging for the educational paradigm. One of the book’s great uses is that it describes how education cannot simply be provided for children to take advantage of however they choose. Instead it should be pushed, tweaked, and tailored to suit every pupil, not just a privileged group. The introduction of Stubborn Roots provides an overview of each chapter and summarises the methods which were used to gather data for each chapter. If only all meta analyses were like this! In fact, the range and actual application of research methods described in this book will impress many researchers. The first page of Chapter 3 details the way that social boundaries are already in place when students arrive at school. Carter describes the way that students gravitate towards those with “similar interests”, leaving groups of friends, for the most part, racially homogeneous. Psychologically this trend would be supported, with literature showing that groups bond over perceived similarities such as race, culture, or even the colour of shirts (see: Muzafer Sherif’s ‘Robber’s Cave’ experiment). However, it is under the sociological lens where these theories most come to life. The students articulated that it was in fact “similar interest” which defined group dynamics and friend choice. Their articulation struck me as a bottom-up explanation of how Pierre Bordieu’s Cultural Capital develops, in which students who are not engaged in education spend time with each other, and often fail to share wider influences and become (or feel) even less engaged by educators. The importance of Chapter 3 lies in the argument that some groups find it easier to access education and that there are structures which mean that groups do not mix, suggesting that active steps need to be taken to address educational disadvantage. This is a message relevant for every country where the education system includes members of different classes or ethnicities. Chapter 4 analyses how students can be equipped to navigate the educational (and wider social) landscape. The chapter is used to present the argument that “cultural flexibility is key to educational success”. Here Carter asks “How do you negotiate your desires to be upwardly mobile in this society with the expectation that you make cultural adjustments to thrive in it?” (p. 88). She takes time to describe the complexities of South African cultural diffusion across the different groups and the way in which adoption and conversion varies. She also focusses on the US before taking the reader through the measures she used to investigate the subject in both countries. Some interesting points are covered and Carter is fair and open when discussing the results. She does not seem to be pushing an agenda, and references to other literature seemed to be included in a genuine attempt to answer confusions and explain (statistically) insignificant results. What is most impressive in Carter’s writing on cultural flexibility is the richness of her text. This is not to say Carter used hyperbolic language; rather, the author acknowledges that the topic is complex. As a result, her prose is honest and includes as many references to her data as a useful explanation requires. There is no poverty of effort on her part – quotes and transcripts are included – and the way in which these first-hand accounts inspired her are shared and analysed. The reader is taken on a twisting road through the investigative process, but Carter ensures that the road is smooth and that the destination is accessible. Carter comments that self-esteem seems to be an important mediating factor for a child’s ability to navigate across or through multicultures. The author then acknowledges that self-esteem was not constant across certain racial or social groups, nor could it predict actual ability. However, Carter leaves us with the insight that self-esteem stems from the appreciation that ability, participation, opportunity, and leadership potential vary across all students, and are not always predetermined by race or class. The contrasting of the US with South Africa is of great use and importance, but readers may be curious to know how other countries would appear if analysed in the same way; how would groups in Brazil, China, or India describe their educational access? More importantly, how would their picture look when compared to the US and South Africa, and what would we learn from the widened focus? Stubborn Roots will be extremely useful for students of pedagogy, and academics and teachers across the world. The chapters each have a clear focus and so can be dipped into by classroom teachers to quickly read about a poignant issue; and yet each chapter is accompanied by enough data and references to inspire further reading or research. Indeed, this space should be occupied more – teachers should refer to research more to influence their practice, and academics should make their findings as accessible to the profession as possible. Jo Taylor is a Teach First Ambassador, educational consultant and social entrepreneur. He teaches Psychology and Sociology A level, mentors and coaches adults and children, writes on education and social innovation and has an academic interest in using Psychology and technology to improve education. He is currently developing a pilot for a free educational website to reward students and increase social validation and parental involvement in education (walldisplay.org). Read reviews by Jo.